Relaxation awaits at Courtyard Spokane Downtown at the Convention Center. Our modern hotel features a prime location near Gonzaga University, River Park Square shopping mall and Centennial Trail State Park. When you're not exploring the vibrant surrounding area, settle into comfort at our spacious rooms and suites. 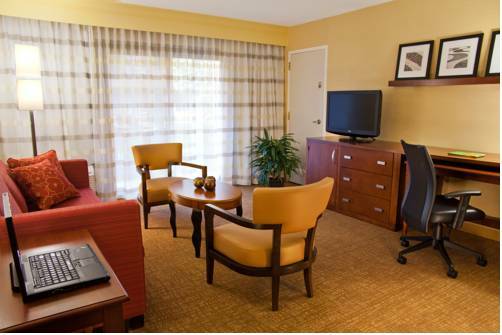 We provide complimentary Wi-Fi, plush bedding and ergonomic workstations for your utmost convenience. Kick-off your morning routine with a scrumptious breakfast and Starbucks coffee at our on-site restaurant. Stop by The Bistro during the evening for delicious dinner options and handcrafted cocktails. Our active travelers can maintain a consistent workout regimen at our 24-hour fitness center. Visit our indoor pool to swim some invigorating laps. Need to host an event? Our three meeting rooms and catering options are perfect for your corporate function or social gathering. Whatever fills your time with us, rest and recharge at Courtyard Spokane Downtown at the Convention Center. The Bistro - Eat. Drink. Connect. : Your downtown Spokane restaurant destination for refreshing breakfast choices in the morning, and a variety of dinner and cocktail options in the evening. The Bistro also offers specialty Starbucks coffee beverages to help you get a jump on the day. Starbucks : Located in our lobby at The Bistro. Starbucks' mission is to inspire and nurture the human spirit - one person, one cup, and one neighborhood at a time.